WebRank SEO IE Toolbar: The one and only SEO toolbar for Internet Explorer. We have had addons/extensions for Chrome, Safari and Opera, so we thought, why leave Internet Explorer users out of the game. The result is here, an easy to use toolbar with asynchronous loading so that you don’t have to leave the webpage to check its ranking and other statistics. The toolbar features Google Pagerank, Alexa, Compete and Quantcast ranks, pages indexed by Bing and Google, Sociometer for your social stats and much more. Get various ranks including the elusive Google Pagerank, Alexa, Compete and Quantcast ranks. Clicking on the buttons for these ranks takes you to their respective websites for more information. The toolbar also shows pages indexed by Bing and Google. These are linked to the search engines pages so that you can check the indexed pages by clicking the button. Then there’s one of the most important parameters, Backlinks, which shows the number of sites linking to yours. Although Bing, Google and Alexa all differ in their definition of backlinks and in-linking, both do maintain that all pages within the website must be well linked so that each page is reachable. 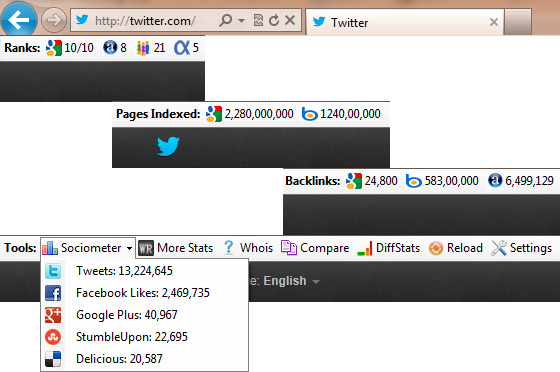 We have also added Sociometer to the WebRank SEO IE Toolbar, which provides you with social stats of your website. This is a new domain to SEO and website popularity, it has been witnessed that social networks and sharing increasing the visibility of your website to a huge extent. The Sociometer provides you with the number of tweets of your domain, its Facebook Likes, Google Plus One’s, the number of times it has been Stumbled Upon, and bookmarked in Delicious. Clicking on the More Stats button takes you to our website WebRankStats.com with detailed analysis of the domain in question. There are several parameters available on our website including in-page analysis, DNS and Header analysis, Server Location among others. You can also do a WHOIS Lookup of the website by clicking Whois button in the toolbar which takes you to our website for its detailed description. Clicking on the Reload button refreshes the data for the current URL. Compare and DiffStats button take you to our website, which you can use to compare stats of two websites and find the difference in stats between two successive updates, respectively. At the heart of the toolbar is complete customization. You can set the parameters you want to see and well as the refresh time for the data fetched by the toolbar. You can even hide the labels to make the toolbar smaller so that you can see more stats in the same space. You can use the toolbar as a comprehensive tool for SEO analysis as well as website comparison to keep a track on your competitors.If you have any queries regarding the toolbar, just email us at support@webrankstats.com. This entry was posted in Addon, Extensions, SEO News, Toolbar and tagged backlinks, internet explorer toolbar, pagerank, pages indexed, seo, seo ie toolbar, seo internet explorer, seo toolbar, social stats, toolbar, webrank internet explorer, webrank seo, webrank seo ie toolbar by WebRankStats. Bookmark the permalink. The new and improved WebRank extension for Opera. Songshub on The new and improved WebRank extension for Opera. emmanayumi on The new and improved WebRank extension for Opera.